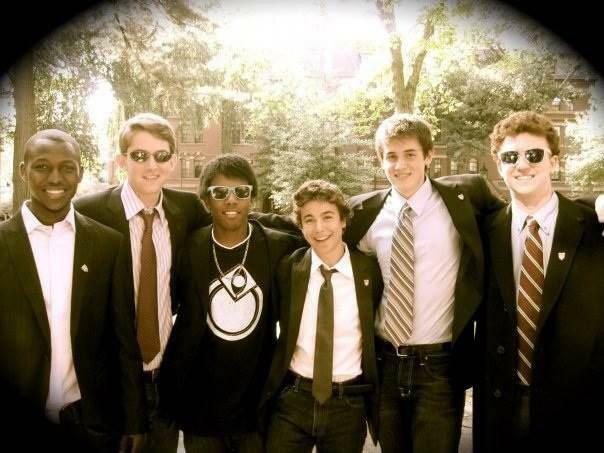 Philip Streich '13, second from left, poses with his freshman roommates from Weld on the day of Freshman Convocation. In addition to being a talented intellectual, Streich was also a social force for his class. UPDATED: Oct. 3, 2012, at 3:04 p.m.
Philip V. Streich ’13, a Harvard student known for his exceptionally broad range of enthusiastic commitments, died Tuesday on his family’s farm near Platteville, Wis., Leverett House administrators wrote in an email Sunday. At times an enthusiastic entrepreneur, a scientific prodigy, a political activist, a record producer, and a grandiose party host, Streich was among the most well-known members of the Class of 2013 during its first year at Harvard. Friends said Sunday that he will be remembered not only for his impressive accolades but also for serving as a socially unifying force for his freshman class. “He was happiest at the center of anything,” said C. Tucker Pforzheimer ’13-’14, one of Streich’s freshman roommates. Streich arrived at Harvard his freshman year already more famous than most students. A native of Princeton, N.J., who moved to Wisconsin in middle school, he had received numerous science awards, including the prestigious Intel Foundation Young Scientist Award, and had co-founded a nanotechnology company. At 14, Streich enrolled at the University of Wisconsin—Platteville, where he began research on nanotechnology. A discovery about the solubility of nanotubes led him to co-found Graphene Solutions, which he continued to work on even as a student at the College. He left Harvard during his sophomore year to work more on the company and his many other projects. Though Streich had earned renown as a teenage scientist, friends say that he was more interested in what he could accomplish socially on campus. At Harvard, he sought out the “quintessential college experience,” Pforzheimer said. When he determined that his dorm room in Weld would not provide ample space for the kind of entertaining he envisioned, he rented an office in the Square to create a novel social space for freshmen. “The Property,” as the office suite came to be known, attracted a cross-section of the freshmen class to both parties and low-key gatherings. Regan Bozman ’13-’14, another of Streich’s freshman roommates, estimated that 60 percent of the class visited “The Property.” Though housed in an office building, Bozman described it as a natural place where blocking groups were formed and relationships started. Even with the dedicated social space, Pforzheimer said a steady stream of students came to their door in Weld just for a chance to meet Streich. Chloe L. Altchek ’13-’14, who lived in Streich’s entryway in Weld, said classmates referred to Streich as “the super genius.” But his humility stood out more than his intellect, she said. During conversations about his research, Altchek said Streich was down-to-earth about his accomplishments.